This article is about the town in Mississippi. For other uses, see Utica (disambiguation). Utica is a town in Hinds County, Mississippi, United States. The population was 820 at the 2010 census, down from 966 at the 2000 census. Utica is part of the Jackson Metropolitan Statistical Area. Utica was originally an area known as Cane Ridge. In 1837, it was given the name Utica at the suggestion of the then postmaster, Ozias Osborn, who came from Utica, New York. The town was incorporated in 1880. Utica was located on the Yazoo and Mississippi Valley Railroad. A weekly newspaper, the Herald, was established in 1897. In the early 1900s, Utica had several churches, eight hotels, a public school for white students, and an industrial college for black students. Agriculture consisted of watermelons, cotton and timber. The settlement had a sawmill, three cotton gins, and a brick plant. The population in 1907 was nearly 1,000. Utica is in southwest Hinds County at the junctions of Mississippi Highways 18 and 27. Highway 18 leads northeast 32 miles (51 km) to Jackson, the state capital, and southwest 28 miles (45 km) to Port Gibson, while Highway 27 leads northwest 25 miles (40 km) to Vicksburg and southeast 20 miles (32 km) to Crystal Springs. According to the United States Census Bureau, Utica has a total area of 3.0 square miles (7.8 km2), of which 0.01 square miles (0.02 km2), or 0.25%, are water. The climate in this area is characterized by relatively high temperatures and evenly distributed precipitation throughout the year. According to the Köppen Climate Classification system, Utica has a humid subtropical climate, abbreviated "Cfa" on climate maps. As of the 2010 United States Census, there were 820 people residing in the town. The racial makeup of the town was 64.0% Black, 26.8% White, 0.1% Native American, 0.2% from some other race and 0.1% from two or more races. 8.7% were Hispanic or Latino of any race. As of the census of 2000, there were 966 people, 339 households, and 241 families residing in the town. The population density was 323.0 people per square mile (124.7/km²). There were 397 housing units at an average density of 132.7 per square mile (51.3/km²). The racial makeup of the town was 30.54% White, 66.36% African American, 0.10% Native American, 0.31% Asian, 2.07% from other races, and 0.62% from two or more races. Hispanic or Latino of any race were 3.83% of the population. There were 339 households out of which 29.5% had children under the age of 18 living with them, 37.8% were married couples living together, 27.4% had a female householder with no husband present, and 28.9% were non-families. 26.0% of all households were made up of individuals and 15.0% had someone living alone who was 65 years of age or older. The average household size was 2.85 and the average family size was 3.43. In the town, the population was spread out with 28.8% under the age of 18, 11.7% from 18 to 24, 24.8% from 25 to 44, 18.3% from 45 to 64, and 16.4% who were 65 years of age or older. The median age was 32 years. For every 100 females there were 94.4 males. For every 100 females age 18 and over, there were 85.9 males. The median income for a household in the town was $27,614, and the median income for a family was $30,083. Males had a median income of $28,594 versus $21,932 for females. The per capita income for the town was $11,491. About 17.1% of families and 27.1% of the population were below the poverty line, including 37.1% of those under age 18 and 24.5% of those age 65 or over. Utica is the location of the URJ Henry S. Jacobs Camp, organized by the Union for Reform Judaism and dating to when there were more Jews in smaller communities in Mississippi. Most now live in larger urban areas with more professional opportunities. The town is home to several churches of various denominations, including the following on Main Street: Utica Baptist Church (founded in 1829 and affiliated with the Southern Baptist Convention), Utica Christian Church (Disciples of Christ), Utica United Methodist Church, and St. Peter's Missionary Baptist Church, a black Baptist church founded in 1867 after the war by freedmen as a mission of the Baptist church. The black Baptists mostly withdrew en masse across the South from the white Baptist churches. They soon founded independent state associations of their congregations in the South, organizing a national convention by the end of the century. There are several other houses of worship in the town proper, as well as others in the county. Utica is served by the Hinds County School District, and is zoned to Utica Elementary-Middle School and Raymond High School in Raymond. It is also the home of the Utica campus of Hinds Community College. Formerly Utica Junior College, the school was founded in 1903 as Utica Normal and Industrial Institute. It was previously home to Hinds County Agricultural High School. Jackson Hines Library System operates the Evelyn Taylor Majure Library in Utica. Alonzo Bradley who played for Texas Southern University and who was the MVP of the 1977 NAIA basketball championship. 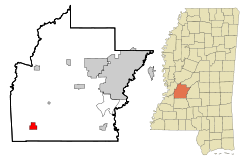 ^ a b "Geographic Identifiers: 2010 Census Summary File 1 (G001): Utica town, Mississippi". American Factfinder. U.S. Census Bureau. Retrieved August 17, 2017. ^ Rowland, Dunbar (1907). Mississippi: Comprising Sketches of Counties, Towns, Events, Institutions, and Persons, Arranged in Cyclopedic Form. 2. Southern Historical Publishing Association. p. 846. ^ "attendance_zone.jpg." 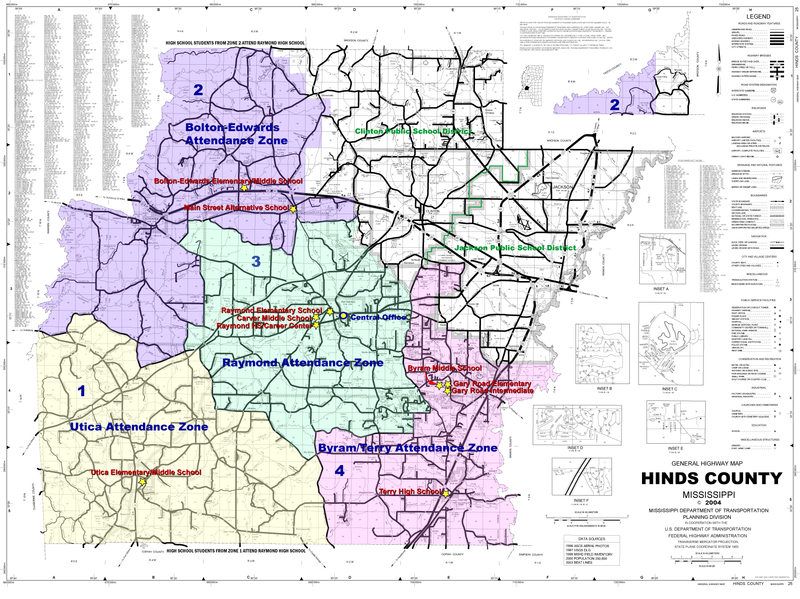 Hinds County School District. July 21, 2011. Retrieved on December 29, 2018. The map states: "High School Students from Zone 1 [Utica] attend Raymond High School"
^ Holtzclaw, William Henry (1915). The Black man's burden. New York: The Neale Publishing company. pp. 104–106. Retrieved 10 January 2019. ^ "Evelyn Taylor Majure Library." Jackson Hines Library System. Retrieved on December 29, 2018. Wikimedia Commons has media related to Utica, Mississippi. This page was last edited on 21 January 2019, at 02:13 (UTC).